The asphalt shingle is a popular roofing material in the United States. With its varied texture plus fire-resistant and tear-strength components, no wonder it’s preferred by most homeowners. Similar to any roofing material, however, asphalt shingles can also deteriorate. Factors such as sunlight, weather conditions, ventilation, and others can affect the condition of a roofing system over time. If your roof has begun losing shingles, then this is one of the tell-tale signs that your roof may need to be replaced. Missing one or two shingles after a severe windstorm is one thing, but missing shingles in multiple locations across your roof is a bad sign. Shingles can be removed or damaged by strong winds, falling tree branches, and snow freezing or thawing. The effect can create an opening in your roof which will eventually allow water to enter your home. If shingles are missing, they should be quickly replaced. Loose shingles, on the other hand, can be sealed using a flashing cement. Black algae stains are just cosmetic and typically will not cause deterioration of your roof. However, the building up of moss and lichen on your roof can signal that your roof has begun decaying underneath the shingles. If you spot algae, you can contact a reliable Tinley Park or Evergreen Park IL roofing company like Rogers Roofing, Inc. for the replacement of the affected shingles. Bear in mind that having a healthy roof is important, so prevention of environmental pollutants, including algae, is necessary for your roof to last. Spotting roof problems and addressing them as soon as possible can result in less costly repairs. Though it’s normal for a roof to decline through time just like any other part of the home, maintenance is still essential if you want the entire system to function at its best. 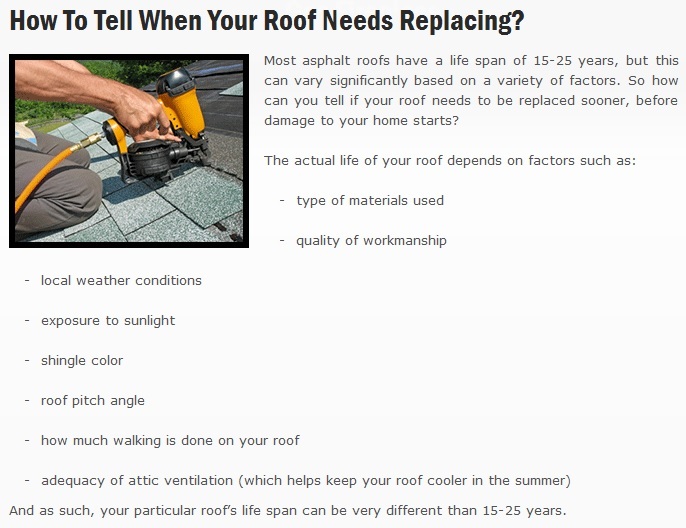 To answer the question, roof replacement will depend on your roof’s current state, of course. It is always a good idea, however, to enlist the help of a roofing expert. With an experienced roofer, you’ll have peace of mind knowing that one of the most important areas of your home is in good hands.